The Brittle Paper Awards 2018 winners were announced on November 19, 2018. They are Sibongile Fisher, Itiola Jones, Stacy Hardy, Panashe Chigumadzi, and Shailja Patel. 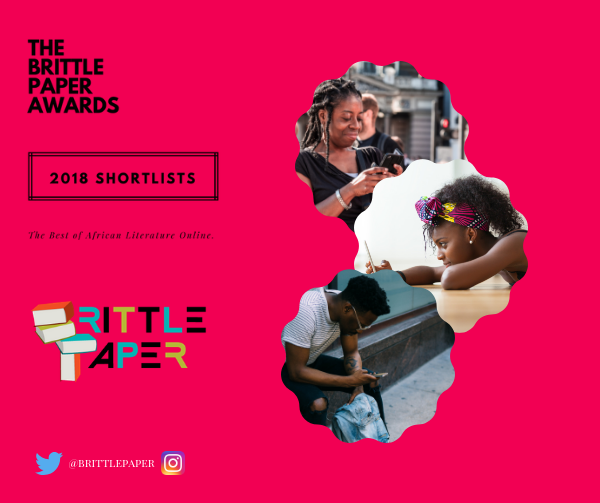 Brittlepaper.com is one of the most influential spaces in the African literary scene today. The blog which started publishing on August 1, 2010 delivers interviews, essays, fiction and poetry from some of the best writing from established and upcoming writers on the African continent and its diaspora. In 2017, the blog decided to found the Brittle Paper Awards with winners to be awarded in Fiction, Poetry, Creative Nonfiction/Memoir, Essays/Think Pieces, and the Anniversary Award. From the shortlist that was announced in August 2017, the winners were Sisonke Msimang, Megan Ross, JK Anowe, Hawa Jande Golakai, and Chibuihe Obi. The 2018 edition of the awards started with the shortlists being announced on October 4, 2018. The categories being awarded were the Brittle Paper Award for Fiction ($200), the Brittle Paper Award for Poetry ($200), the Brittle Paper Award for Creative Nonfiction ($200), the Brittle Paper Award for Essays & Think Pieces ($200), and the Brittle Paper Anniversary Award ($300) for writing published on their blog. The winners of the awards have been announced and they are Sibongile Fisher, Itiola Jones, Stacy Hardy, Panashe Chigumadzi, and Shailja Patel. For more information about the winners and the citations for their wins please click here. Previous Previous post: Chimamanda Ngozi Adichie for Abantu Book Festival 2018. Next Next post: Nigerian Prize for Literature 2017 winner Ikeogu Oke has passed on.